Project Transaqua is under way, the pilot project of a possible win-win cooperation between Italy and China in Africa, within the Belt and Road Initiative. An example to study for our policy makers and companies on how, on the one hand, doing business and, on the other, helping the development and economic stabilization of Africa. Born from an intuition of the great technician Francesco Curato and executed by the then foreign director of Reclamation (IRI Group) Marcello Vichi, the study “Transaqua” showed more than thirty-five years ago that with a bold construction work it would have been possible to bring water from the basin of the Congo to that of Lake Chad, restoring the dying “Lake in the Desert” in its original dimensions and at the same time giving Africa a water, road, energy and ago-industrial development infrastructure that would have taken off the productive economy of much of the continent. Today, thanks to the collaboration born a few years ago between the dott. Vichi and the Schiller Institute, that idea, remained a “dream” for too long, becomes possible and becomes a pilot project to demonstrate the feasibility of the cooperation model of the Belt and Road Initiative. 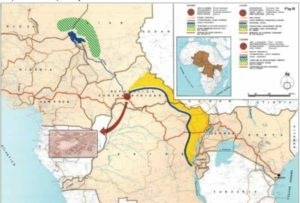 It will be an Italian company, Bonifica, and a Chinese one, PowerChina, to perform the feasibility study approved by the heads of state of the coastal countries (Lake Chad Basin Committee), met in the Nigerian capital of Abuja at the end of February, and financed with an initial donation of 1.5 million from the Italian government. Transaqua is the answer to those who see the Belt and Road Initiative from an exclusively geopolitical angle and do not believe in the possibility of achieving international cooperation on a win-win basis, as President Xi Jinping strongly supports. The strategic cooperation agreement between the Italian Bonifica Spa and the Chinese giant PowerChina is just one example of how this cooperation can be set to benefit not only the partners but above all the third countries that are the subject of this cooperation. Transaqua is the project of a waterway that starts from the south of the Democratic Republic of Congo (DRC), near the Great Lakes region, and crosses all the tributaries of the right bank of the Congo, collecting, with artificial barriers, enough water from forming a channel of the Nile and, by gravity, “scollina” on the border between the Central African Republic and Chad, pouring up to 100 billion cubic meters of water into the main tributary of Lake Chad, the Chari. The almost thirty dams planned along the 2400 km of the Transaqua route will allow generating large quantities of hydroelectric energy and regulating the flow of rivers, in order to allow the development of agricultural activities, livestock and industrial settlements. There has been much talk in Europe of “Marshall Plan” to create jobs and development in Africa and to stem the phenomenon of immigration, but so far nothing has been done. Transaqua is the first, real concrete plan able to create jobs for decades and take off production development. It is hoped that the European governments, which have so far sabotaged the project, will seize the importance of this opportunity and adhere with resources and political will, laying the foundations for a “new paradigm” in international politics. This comment has been kindly written by Claudio Celani, Co-Editor of EIR Strategic Alert Service. They are getting the cart before the horse here. to the first dam site on the Ubangi River.